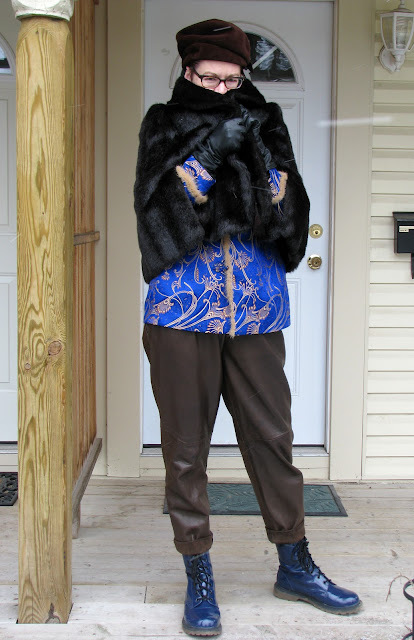 A quick outfit post from last Saturday, when it was cold, windy, and yes.....that is snow you see on the ground and making white streaks in the air. My expression of displeasure is directed at Mother Nature. It's April already, for heaven's sake. To quote one of my favourite line of dialogue from the film Moonstruck - "Snap out of it!!" Spring, Spring, Where Art Thou Spring? love the fur trimmed jacket. So cute with your collar up over your nose! C'mon, spring! You are definitely royalty here thumbing Mother Nature oh so elegantly. I'm afraid to say the s word in case it heads my way. Well the cold and the snow and the lack of Spring are not so good, but wow, look how incredible you look in response to the bad weather! That is very good indeed! The fur-trimmed jacket is amazing, and your new lion's head door knocker bracelet is a really unusual and interesting piece - jewellery that makes me smile is always a good thing! The FAUX FUR!!!! The BRACELET!!!! 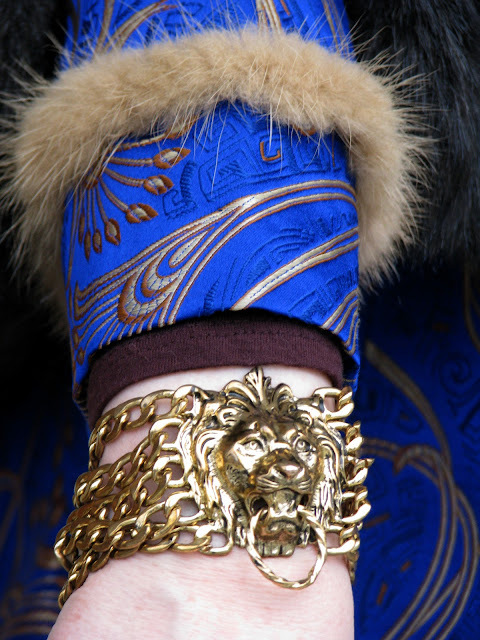 That lion bracelet is beyond. The embroidered coat is amazing. The leather pants, the style and cut of those are just too perfect and I love the cuffs-- the cuffs are everything. Very cool outfit. That bracelet is so cool! Oooo, that embroidered top looks gorgeous! And how perfect to have a door knocker of a bracelet to go with it. Watch out for the Bolsheviks! The weather gets more and more bizarre each year - we've had a gorgeous spring, and yet I see snow in everyone's pictures - in April! I hope you get some warmth soon. You look fabulous regardless of the weather!! love the cobalt blue on you!! Love your take on Julie Christie in Dr. Zhivago! (That 1965 David Lean epic was "The English Patient" of our generation.) Wait, is that Omar Sharif racing across the snow covered steppes in his sleigh for a rendezvous? Do tell us how that turns out! fun to find another london ontario blogger!!! LOOOOOVE your bracelet! your style is so courageous! love it. I remember the hat purchase like it was yesterday. How stunning it looks with your fur trimmed embroidered jacket. Hoping that Spring greets you soon! can't express how much I love your embroidered jacket and faux fur capelet and that fabulous booties!, and so lovely that you make us remember Moonstruck, so funny and delightful film! I'm so glad you bought that bracelet! Whoo!! It looks great with the gold thread in the jacket. OMG it looks so cold!!! Your jacket is amazing and the bracelet is GOOORGEOUS, as are you, always, Shelley.